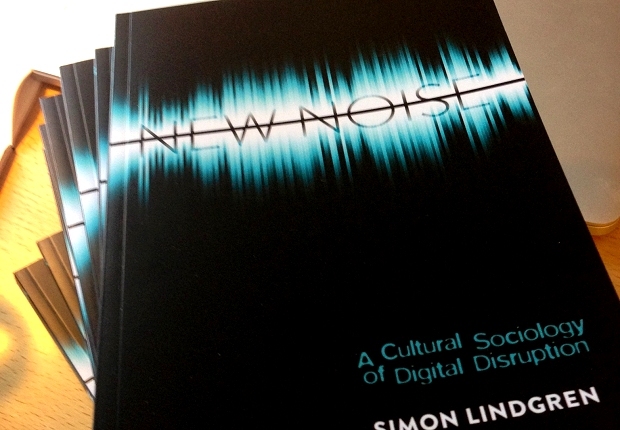 I was honoured to be invited to write a foreword for Simon Lindgren’s book, New Noise: A Cultural Sociology of Digital Disruption, which was published by Peter Lang earlier this year. A few pages into New Noise, Simon Lindgren provides a telling quote from John Fiske’s book Understanding Popular Culture. Fiske observes, with dismay, that scholars of popular culture have typically fallen into one of two camps: those who don’t situate their analysis within ‘a model of power’, and so are free to be nice about their subject matter , and those who do, and therefore feel obliged to condemn it. Both approaches therefore become predictable rather than challenging. Fiske suggests that there could be a ‘third direction’, which balances consideration of the power of media systems with the power of ordinary people. What a novel idea! Fiske’s book was published in 1989, almost 25 years ago. For me, this was the year I left home and went to university. The media landscape in the UK was print, radio, and 4 channels of TV; the World Wide Web had not been invented yet. ‘Interactivity’ referred to the capacity to call up a weather forecast on teletext, which, as the name suggested, was a set of texts available on your telly. In short, it was ages ago. Since then, the idea of a ‘third way’ in other spheres – notably politics – has come to seem ordinary, and then outdated. It is ordinary because it’s no longer a new idea, but also because the general principle came to be broadly accepted, even if the ‘third way’ phrase was not. In many countries, mainstream politics is rarely about genuinely left-wing versus right-wing ideas these days, and the middle-ground third way describes the standard arena for a majority of political parties (although the ‘third way’ was really meant to be a radical alternative to the norm, not just a middle-of-the-road view). In media and communications studies, however, Fiske’s argument could be presented tomorrow and would still seem fresh and relevant. The technologies and opportunities have changed to a huge extent, but the approaches of media scholars have not. Indeed, if it seemed for a while – during, say, the first decade of the 21st century – that the old boundaries had shifted, we now see the lines being redrawn more sharply. Scholars such as Christian Fuchs (2008, 2011) have led a thoughtful but decidedly Marxist restatement of what’s wrong with today’s media system. James Curran, Natalie Fenton and Des Freedman received warm reviews for Misunderstanding the Internet (2012), a book which lives up to its title by mixing a less sophisticated kind of Marxism with a surprising nostalgia for a time when only elites could express themselves in widely-available media. Meanwhile, incisive but less partisan analysts, such as Clay Shirky (2008, 2010), who take an interest in what social media might mean within the lives of their users, are dismissed as ‘evangelists’ for new technologies merely because they have failed to join in with a more knee-jerk rejection of their possible value. So, a ‘third way’ in media and communications studies would be very welcome. And that is what Lindgren offers in this timely and persuasive book. I have known Simon Lindgren for a few years. I say ‘known,’ but until recently we had not met in person. As noted above, things changed a lot over the past quarter century, so like many modern relationships, this one began online. But really, when I finally met him on a visit to London, it didn’t make that much difference. He was as I had known him via electronic communication: modest, intelligent, generous. I was pleased to be invited to write a foreword for his new book, which I understood to be called New Noise. I expected it would be good but didn’t know what it would be about. So I was even happier when I received the manuscript with the subtitle, A Cultural Sociology of Digital Disruption. The notion of ‘disruptions’ has been central to my thinking about new technologies, in particular anything running on the internet, for a while now. I like it for the straightforward visual image which it suggests of something erupting from below and breaking apart what was already there. And I mean: in a good way. To illustrate the idea of disruptions in a presentation, I tend to use Google image search to grab pictures of dramatic earthquakes which have smashed up some important bit of infrastructure. Of course, those are not happy events. But the disruptions in media and communications which the internet has made possible are almost always exciting and interesting innovations, even if their outcomes are not universally desirable. So it’s about what we study, how we study it, and how we engage others about it. Only the first of these describes the task of keeping up with one’s subject matter, which is an established, predictable thing that you have to do as a scholar of any subject. The other two potentially undermine and screw up the established way of doing things, and are therefore especially exciting. In any case, Lindgren covers all three: the first, in his substantial analysis of a changing media landscape and what people do in it; the second, with his innovative data-mining methodology, Connected Concept Analysis, which offers ‘a qualitative approach to quantity’ (see Chapter 3); and third – although perhaps to a lesser extent in this traditional object, a book – in his online videos, blog and tweets. In New Noise, Lindgren steers a path between what technical systems can do within a culture, and how people within that culture respond and innovate for themselves. Of course, that means it’s not just a study of how humans respond to their technological environment, because those technical systems were themselves responses and innovations, made by humans, to previously existing aspects of technology and culture. It is therefore, in the old-fashioned terminology of media studies, about integrating the study of ‘media institutions’ and ‘media technologies’ with the study of ‘media audiences’ or ‘media users’. This is the kind of ‘third way’ that media scholars have been calling for for a long time. But more significantly, it cleverly mirrors the concept of structuration as developed by Anthony Giddens (1984), who was also the preeminent advocate of the ‘third way’ in social theory and politics (Giddens, 1998). The theory of structuration was Giddens’s attempt to overcome the unhelpful divide between those who studied societies or cultures on a macro level (for example, in our case, what media institutions and systems do) and those who focused on the micro level (here, what media users do). He achieved this by noting the cycle of influence between the two levels: the macro level defines the circumstances within which people operate, but then people’s actions can, cumulatively and over time, bring about changes in the collective understanding of a culture, which gradually changes the macro level itself; which changes what people within that culture consider to be possible or legitimate; and so on. Simon Lindgren offers something similar here, showing how the normally separate spheres of media systems and media users are connected in a mutually dependent cycle. It’s never straightforward or simple, though. Across a series of case studies, Lindgren observes how collaboration and conflict go hand-in-hand, and that online communication and creativity is always a complex criss-crossing of different kinds of inputs, done for many diverse reasons, with an array of simultaneous, contradictory outcomes which are never the final word on a situation but merely the starting point for further complex interactions. Multiplied by several million. This is all a bit too vast to be thinkable, so the case studies help to bring focus. In the case of YouTube, for example (Chapter 7), Lindgren finds that those who leave comments can be casually antagonistic when they are acting as individual consumers/participants. The lack of a shared sense of a project often leaves them with just a ‘thumbs up’ or ‘thumbs down’ response to the work of others. But when people felt that they were collectively engaged in something together – as Lindgren finds in the comments attached to user-created tutorial videos, where people want to share their learning with others who are seeking that input – the comments are much more positive and oriented to helping others, even where those others are geographically remote, and invisible, and you’re unlikely to ever meet any of them. In other words, it is the binding of people into a shared enterprise which makes all the difference. This is what I argued in Making is Connecting (2011), but it’s nice to see it supported with new empirical examples and with Lindgren’s thoughtful insights. Similarly, the study of those who create and share subtitles files for movies and TV series (Chapter 6) shows that a common project leads people to be aggressively altruistic, but also altruistically aggressive: Lindgren quotes examples of users who are so passionately engaged in the project of making high-quality subtitles available that they get just as passionately cross when other people are not contributing in what they see as the ‘correct’ way. These observations are at the ‘micro’ end, on the quality of social interactions. Lindgren’s concerns are also, of course, political, and these interests play out in both macro and micro settings. In particular he has a concern with ‘spaces’, which I think you can picture like pockets of conversation being temporarily inflated, by groups of people, in the zone between the crowded micro level of individuals on the ground and the more abstract macro level of society, culture, and economic and communications systems, above. While academic talk about ‘space’ and ‘spaces’ is often maddeningly abstract, in Chapter 4 Lindgren manages to show how a Twitter hashtag – barely a ‘thing’ at all – can function as a ‘virtual settlement’, which pops up in a more-or-less unplanned way and becomes the site of discussions, through usage, for as long as people want it. These conversations, whilst apparently non-organised and open and therefore quite ‘anarchic’, also tend to follow certain rules and norms; Lindgren shows, in effect, that human beings are quite good at participating in communities even when nobody has set any formal laws, or restrictions, or told us what to do. The earlier observation that nothing is straightforward or simple – in the relationship between macro level cultures and micro level behaviours – is especially brought to life in the interviews with online movie pirates in Chapter 9. Here we find individuals who see themselves as political actors, who are repelled by the commercial system of Hollywood movies, and who express this by sharing and viewing illegal copies of those movies. There seemed to me to be a weird contradiction here – fighting the hated Hollywood culture by means of consuming its products. I’m keen on people using the internet for creative and innovative purposes, and I’m keen to see the circulation of alternatives to mainstream art and entertainment. But sharing and watching copies of commercial movies that you, apparently, don’t even like, doesn’t seem to fulfil any of these aspirations, so I found it a bit odd. What it does show is that the flows of creativity and resistance between the macro and micro levels of a culture can be sometimes powerful, sometimes quirky and confused, and never entirely predictable. Throughout this book, Lindgren looks at forms of cultural disruption which have political implications, or which relate to politics, but which are also subtle and complex, and don’t always point in one clear direction. Readers looking for evidence that technology ‘X’ produced revolutionary change ‘Y’ are likely to be disappointed. But we should applaud the author for his insistence that theories about the relationships between technologies and culture should be based on ‘what actually happens’. To the external observer this may sound strangely obvious, but claims-making in this sphere is often based on ideology rather than a good understanding of how things work and what is really going on. As Lindgren says in the concluding chapter, ‘Ultimately this book is a plea for taking internet studies into a new era of systematic empirical inquiry of the processes by which the power of the good examples might be harnessed towards a more substantial transformation of the public’. Lindgren avoids simplistic binaries, refusing to find that certain technologies are ‘good’ or ‘bad’, or politically ‘effective’ or ‘ineffective’. Instead, he offers insights into the complexities of the ways in which technologies are used, whilst also offering hope – ‘the power of the good examples’ – that we can foster and harness creative and disruptive practices, whether in learning, community-building, entertainment, politics, self-expression, or other spheres. He reminds us that complex networks of differently-motivated activities can still offer challenges to the status quo, and the ‘new noise’ might be a cacophony of voices asking how we can do things in better, fairer, and more inspiring ways. Fuchs, Christian (2008), Internet and Society: Social Theory in the Information Age. London: Routledge. Fuchs, Christian (2011), Foundations of Critical Media and Information Studies. London: Routledge. Gauntlett, David (2011), Making is Connecting: The social meaning of creativity, from DIY and knitting to YouTube and Web 2.0. Cambridge: Polity. Giddens, Anthony (1984), The Constitution of Society: Outline of the Theory of Structuration. Cambridge: Polity. Giddens, Anthony (1998), The Third Way: The renewal of social democracy. Cambridge: Polity. Shirky, Clay (2008), Here Comes Everybody: The Power of Organising Without Organisations. London: Allen Lane. Shirky, Clay (2010), Cognitive Surplus: Creativity and Generosity in a Connected Age. London: Allen Lane.